This story was written by Jim VandeHei and Mike Allen. Republican officials say their radically curtailed convention offers a big political opportunity for the party to redeem itself on the competence issue - and for John McCain to step out of President Bush's shadow once and for all. There's no doubt it's a bit morbid to think about (and write about) the politics of a potential natural disaster and the thoughts - and prayers - of those gathering here are keenly focused on the Americans who face potential peril in Gustav's path. That's true for Republicans, Democrats and members of the media alike. But this is a national political convention and the potential political fallout of Gustav is a topic that was consuming Republican Party and McCain campaign officials on Sunday - one day before the official start of what had been planned as four days of festivities here. "You don't wish for it, but it shows McCain dealing with a surprise - a big event that has consequences on people," a convention planner said. "It's redemption for the Republican Party on the competence issue. The convention ends up being about John McCain showing the best way to serve a cause greater than yourself." The storm carries with it political risk, too: if the government botches the emergency response it could further erode the public's confidence in the GOP's governing competence. The looming storm ravaged convention plans, forcing Bush and Vice President Cheney to cancel live speeches, Monday's schedule to largely be cancelled and the media to turn its focus to what could be another Hurricane Katrina or worse. But, in cold political terms, this could be a very good thing for McCain. At the very least, it pulls an unpopular president and vice president away from here at a time when Democrats are ready to hit McCain with a barrage of ads and talking points linking him to Bush. One GOP consultant on what the absence of a Bush speech means for the party: "A whole series of Obama ads now in the dumper." Convention planners weren't thrilled with the lack of star power during the first few days anyway. GOP leaders - and the Obama/Biden campaign as well - also are being carefully proactive to do everything possible to help the beleaguered residents of the Gulf Coast. The McCain campaign plans to write a check for hurricane relief and was making charter jets to delegates from the areas in Gustav's projected track who need to fly home. McCain and his new running mate, Alaska Gov. 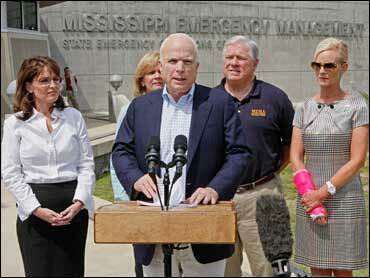 Sarah Palin, flew to Mississippi on Sunday to show they are on top of things. Back here, there is talk of convention-goers raising money for victims or putting together care packages for victims - a genuinely good gesture if they do it and probably good politics, too. "This is McCain doing the right thing, showing leadership and taking command," the convention planner said. "He's deciding how to handle this, and Bush is irrelevant." The unexpected disaster also offers the GOP a do-over on Bush's disastrous response to Katrina three years ago. If the government can do a much better job of responding to a natural disaster this time around, it can only help the GOP. The officials would not discuss the political implications on the record. But their thinking is clear, based on not-for-attribution interviews. The positive byproducts: No photos of Bush at the convention; an even lower Cheney profile; a chance for an unusual, dramatic charitable move at the convention that cuts against stereotypes about GOP; and the storyline becomes Gustav drama, not McCain vs. the GOP, or abortion or any other divisive issue. Republican officials said the images from here will present a positive contrast with the celebratory Democratic convention last week in Denver. The storm could paralyze Democratic efforts to hit McCan on several fronts. "The contrast between McCain's responsibility and the fanatical followers in the temple of the Lord Obama won't be lost on everyday husbands and wives trying to meet their own responsibilities," a Republican official said. Frank Luntz, a Republican consultant who was in the Twin Cities for the convention, warned that Gustav could hurt the party because it "reminds everyone of Katrina, which was a disaster for the GOP." "It doesn't allow them to pout forward a message contrary to Obama because everyone is focused on the hurricane," Luntz said. "Delegates were very turned on about Sarah Palin, but now they don't get to celebrate that." Charles Mahtesian and Jonathan Martin contributed to this story.